According to Rutherford's model, an atom consists of a positive nucleus with the electrons moving around it in circular orbits. However it had been shown by J. C. Maxwell that whenever an electron is subjected to acceleration, it emits radiation and loses energy. As a result of this, its orbit should become smaller and smaller Fig.. and finally it should drop into the nucleus by following a spiral path. This means that atom would collapse and thus Rutherford's model failed to explain stability of atoms. Another drawback of the Rutherford's model is that it says nothing about the electronic structure of the atoms i.e., how the electrons are distributed around the nucleus and what are the energies of these electrons. Therefore, this model failed to explain the existence of certain definite lines in the hydrogen spectrum. 1. The electrons revolve round the nucleus only in certain selected circular paths called orbits. These orbits are associated with definite energies and are called energy shells or energy levels or quantum levels. These are numbered as 1, 2, 3, 4 �.. etc. (starting from the nucleus) are designated as K, L, M, N �.etc. (Fig.). 2. As long as an electron remains in a particular orbit, it does not lose or gain energy. This means that energy of an electron in a particular path remains constant. Therefore, these orbits are also called stationary states. In other words, angular velocity of electrons in an atom is quantised. 4. If an electron jumps from one stationary state to another, it will absorb or emit radiation of a definite frequency giving a spectral line of that frequency which depends upon the initial and final levels. When an electron jumps back to the lower energy level, it radiates same amount of energy in the form of radiation. 1) According to Bohr, the radiation results when an electron jumps from one energy orbit to another energy orbit, but how this radiation occurs is not explained by Bohr. 2) Bohr Theory had explained the existence of various lines in H-spectrum, but it predicted that only a series of lines exist. At that time this was exactly what had been observed. However, as better instruments and techniques were developed, it was realized that the spectral line that had been thought to be a single line was actually a collection of several lines very close together (known as fine spectrum). Thus for example, the single H�-spectral line of Balmer series consists of many lines very close to each other. 3) Thus the appearance of the several lines implies that there are several energy levels, which are close together for each quantum number n. This would require the existence of new quantum numbers. 4) Bohr's theory has successfully explained the observed spectra for hydrogen atom and hydrogen like ions (e.g. He+, Li2+, Be3+ etc. ), it can not explain the spectral series for the atoms having a large number of electrons. 5) There was no satisfactory justification for the assumption that the electron can rotate only in those orbits in which the angular momentum of the electron (mvr ) is a whole number multiple of h/2pi, i.e. he could not give any explanation for using the principle of quantisation of angular momentum and it was introduced by him arbitrarily. 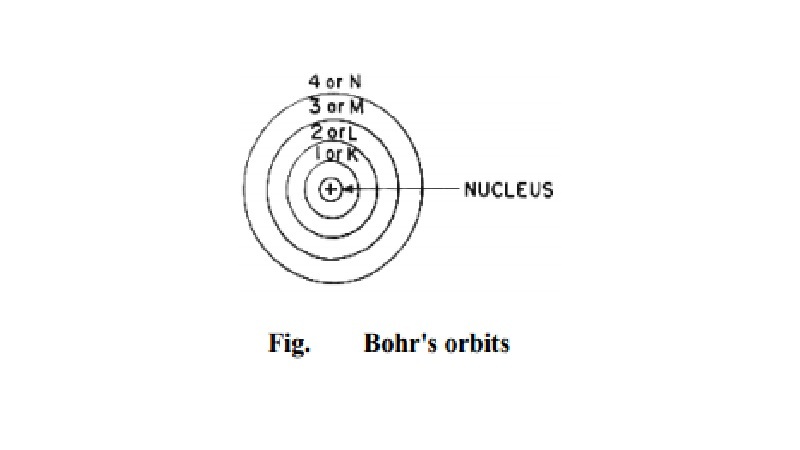 6) Bohr assumes that an electron in an atom is located at a definite distance from the nucleus and is revolving round it with definite velocity, i.e. it is associated with a fixed value of momentum. This is against the Heisenberg's Uncertainty Principle according to which it is impossible to determine simultaneously with certainty the position and the momentum of a particle. 7) No explanation for Zeeman effect: If a substance which gives a line emission spectrum, is placed in a magnetic field, the lines of the spectrum get split up into a number of closely spaced lines. This phenomenon is known as Zeeman effect. Bohr's theory has no explanation for this effect. 8) No explanation of the Stark effect: If a substance which gives a line emission spectrum is placed in an external electric field, its lines get spilt into a number of closely spaced lines. This phenomenon is known as Stark effect. Bohr's theory is not able to explain this observation as well.